The information has been carefully prepared to answer your questions and help you become an integral part of our school. 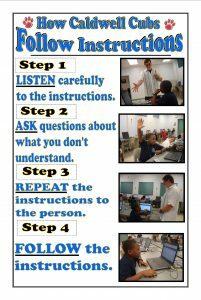 Communication is a critical part of the learning process. This handbook will become an important part of the communication between home and school. It is by working together that we can secure the best education for our children. We are a TEAM and Together Everyone Achieves More! Breakfast Served 7:30 – 7:55 a.m. While operating a vehicle on campus, please do not use your cell phone for the safety of our students. Morning drop-offs begin at 7:30 a.m. There is no supervision before 7:00 a.m. Please pull all the way up to cones to allow for maximum unloading of cars. Families picking up students in the afternoon must stay in their car and drive through the car pick-up line. A car rider tag must be placed on the dashboard. Car rider tags will be issued at Orientation. After the school year begins car rider tags will be issued by the office staff. All visitors must check in at the office. Anyone on campus without a visitor badge will be asked to go to the front office to receive one. Students must be in their classroom by 8:00 otherwise, they will be marked tardy. After that, all students are tardy and must go to the office with their parents to get a Tardy Pass. Only authorized adults on the student’s emergency card may pick up that child. Everyone checking out a child will be required to show identification. When your child is absent, please call our office before 9:00 a.m. (863) 965-5470 or report the absence on our website. 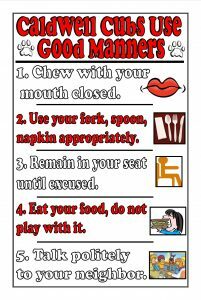 Upon returning, students will need to bring a note for their absence. All schoolwork must be made up in a timely manner. School attendance is DIRECTLY related to school achievement. Parents have the responsibility to make sure that students attend school every day, arrive promptly and remain throughout the scheduled day. All absences are classified as excused or unexcused. Family funeral All other absences are defined as unexcused according to the Polk County Student Code of Conduct. Section 2.04 of the Student Code of Conduct: Any student who is absent without an excused absence for more than 5 (five) days during a nine-week grading period will be reviewed by an Attendance Committee. Make every effort to schedule medical and dental appointments after school hours or during holidays. Call the school office by 8:00 a.m. if a child is not in school and send a written note to school following a student absence. The note must include the date, reason for absence, signature of parent/guardian and phone number. Connect-Ed will call parents each day for students who are absent. Send a written request to school in advance if a student has an appointment during the school day. A parent/guardian must sign out students from the office or those authorized on the student emergency contact list. The person signing the child out must be prepared to produce a picture I.D. When a student arrives after the tardy bell, the parent must report to the office to check the student in before the child will be admitted to class. Poor attendance or persistent tardiness will show itself in poor academic performance. **Excessive absences or tardiness will require a parent conference with an administrator and will affect academic performance. Student academic progress will be reported every nine weeks through Interim Reports and Report Cards. Participate and put forth their best effort. Make progress toward the goal of becoming self-disciplined, self-directed, problem solving and communicators. Bring necessary materials to class. Complete and turn in assignments on time. Get agenda signed each night. School behavior will be reported each nine weeks on the Study Habits/Personal Development portion of the report card. Profane language or gestures directed toward any staff member. Excessive and repeated classroom disruptions. Destroying or defacing school property (including graffiti). Leaving the classroom or grounds without permission. Defiance or disrespect to staff or students. Repeated Offenses: Consistent disregard for behavioral or academic expectations will be subject to administrative review and possible reassignment to an alternative school. Violations of the Student Code of Conduct or Florida law will be dealt with as explained in Polk County’s Student Code of Conduct Handbook. Show commitment for learning and support for school staff. See that my child attends school regularly, is on time and is prepared with the necessary materials. 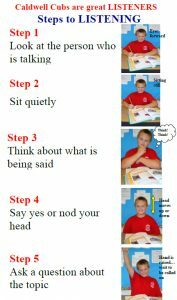 Provide a quiet place at home for schoolwork and make sure the work is completed and returned. 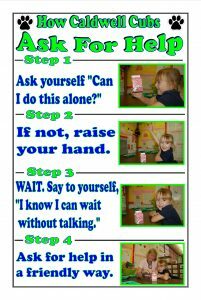 Communicate daily with my child’s teacher through the agenda. Meet with my child’s teacher at least three times a year. 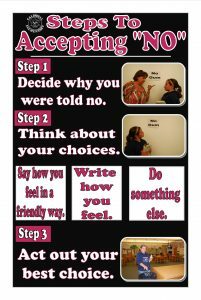 Encourage and teach my child to be respectful to other students and adults. 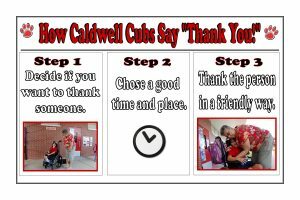 Communicate and support the mission, vision and goals of Caldwell. Provide a caring and nurturing environment. Help students identify and reach their potential. 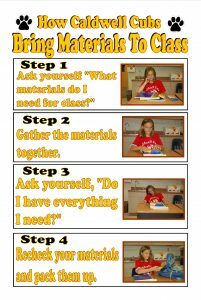 Promote students’ abilities to inquire, communicate, think logically and critically. Promote and support a feeling of respect for and between our students, parents, faculty and staff. Seek ways to maintain and develop professional excellence. Use technology as an academic tool. Develop real world problem solving and applications in all subjects. 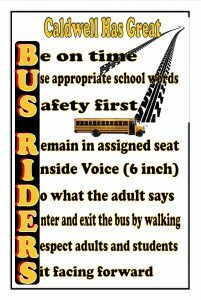 Students riding the bus need to use quiet voices stay seated and obey the bus driver and bus rules. Bike riders must walk their bikes on the school grounds. Bikes are to be kept in the bike racks. All bikes must have locks and bike riders must wear a bike helmet. Walkers/bike riders are to enter campus via the sidewalk on the south side of campus coming from Dairy Road. Students should be dropped off in the drop-off/pick-up line beginning at 7:30 a.m.
Students must be in their classroom when the 8:00 tardy bell rings. Please pull down as far as possible before letting your child out. Please do not use your cell phone while on dropping off or picking up. Students requiring medication must have a copy of the Polk County Authorization for Medication form signed by their physician on file. NO medicine will be administered without this form; this includes over -the- counter medications. Medicine must be in the original labeled container. All medicine will be kept and given in the clinic. No medicine may be kept by the student including cough drops. It is the responsibility of the parent to bring medications to the office. Students (per PCSB policy) are not allowed to bring medicine to school or take home any medicine. Food items must be commercially prepared and individually wrapped by the commercial supplier to protect students against food borne illnesses. Beverages should be purchased ready to serve. Home prepared foods are not permitted. 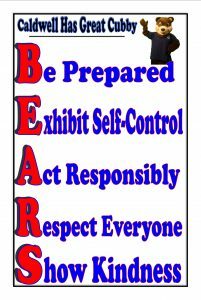 Positive Behavior Support (PBS) teaches student appropriate behavior and rewards students who demonstrate appropriate behavior. The objective of PBS is to encourage appropriate behavior in order to provide a safe and orderly learning environment that promotes excellence in all things. 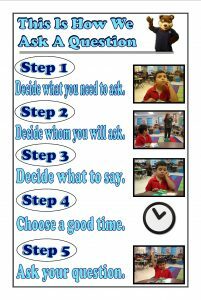 Identifying and teaching expected behaviors. 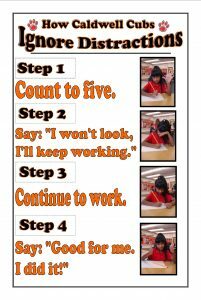 Reinforcing and rewarding expected behaviors. Enforcing consistent meaningful consequences when violations of theexpected behaviors occur. What does PBS look like? 1. Expectations are taught and followed throughout the school. 2. 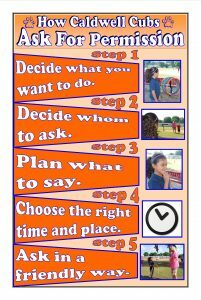 Students, staff and parents are taught the expectations throughout the year. 3. 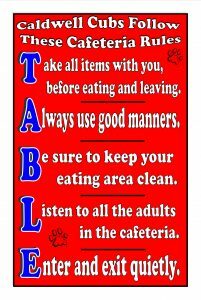 Students and staff are able to state the expectations. 4. All faculty members model the PBS expectations. 5. Students and teachers are rewarded for using the appropriate behavior expectations. B – Be Prepared – Having everything needed for school and being ready for instruction. Transitions from one activity to the next without disruption. E – Exhibit Self–Control – The ability to make decisions about how and when we express ourfeelings and which of our impulses to act on; having power or control over one’s actions; knowingright from wrong; thinking before acting. A – Act Responsibly – Doing what you are suppose to do without being told, thinking before you act,and being responsible for your actions. R – Respect Everyone – To show concern or consideration: behaviors that help people feel calmer, safer, friendlier, and more cooperative. 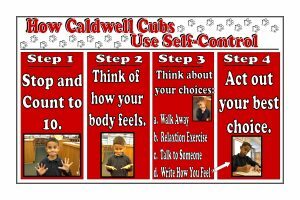 How is Caldwell teaching appropriate behaviors? 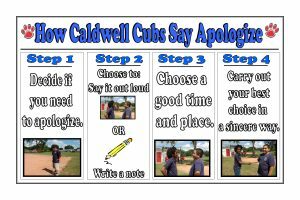 Caldwell introduces a new social skill every two weeks. 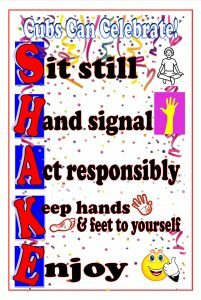 The skill is reviewed daily on the morning news show (CBTV News) and posters are in every classroom. 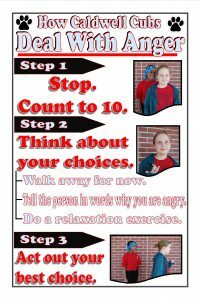 The posters have steps and illustrations to help remind the students of the appropriate behavior. You may view our posters below.